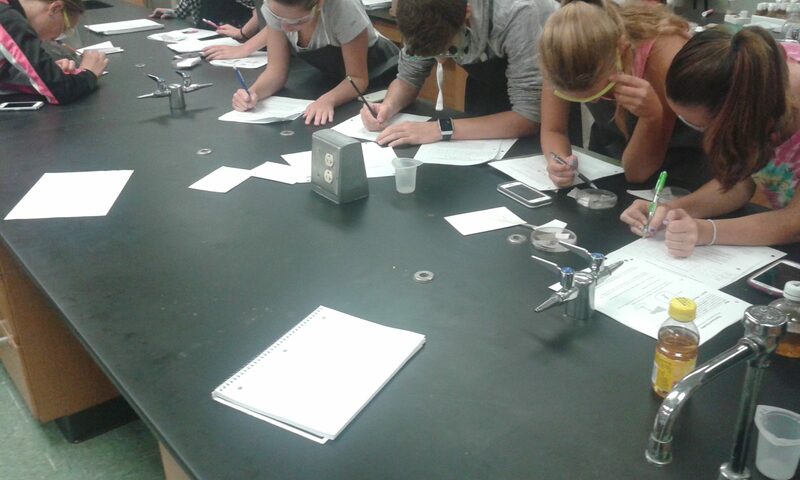 This year, I am working on what kind of labs my students are conducting, and building my students skills in inquiry. We have spent the first weeks focused on questioning and the inquiry process. My students have already conducted a guided inquiry on Drosophila behavior in choice chambers where they came up with their own testable and measurable conditions, and followed through the scientific method. It was a great learning experience for all of us, but I want to find ways to make these labs a richer experience for the students. Students are investigating Drosophila behavior in their choice chambers. In a process to embed the Scientific Practices and Cross-Cutting Concepts into my labs, I am starting to follow the model for Argument Driven Inquiry in my classes. I have so far been very pleased in how my students have engaged in the experiences, and it’s exciting to see my students have a chance to engage in planning investigations and leading their own learning. They also get a chance to share their ideas and understanding with the class when they defend their claims in an argument session. My students are currently working on their second argument. In our first argument, students worked on making and defending a claim to answer the question “Should Viruses be considered a living or non-living thing?” We talked briefly about the problem, and the data they had access too, but I did not explicitly teach them much of the characteristics of life before jumping in. I simply helped model the process and what are final product could look like. I was blown away by the results. 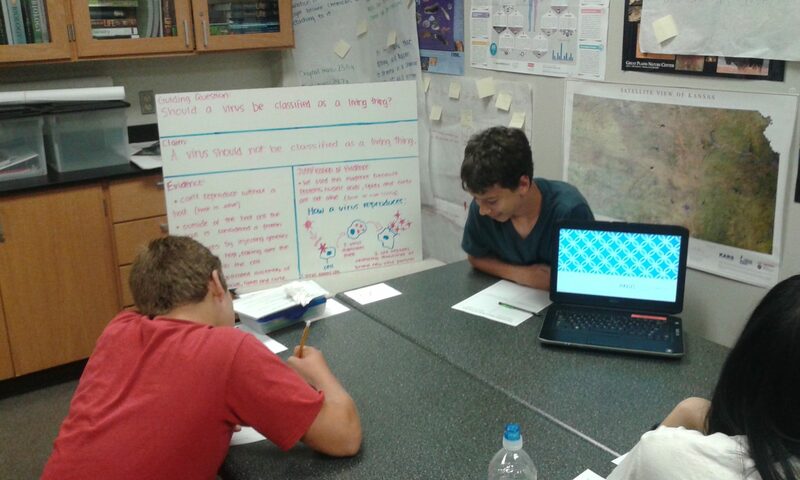 One group of students begins defending their claim to whether viruses are living or non-living. Their evidence and justification were a key part of their boards that they were assessed for. Most of my students were digging much deeper into the content then I had ever planned on assessing them for. I had many groups looking into how viruses replicate and asking questions about why some viruses had DNA and others RNA. 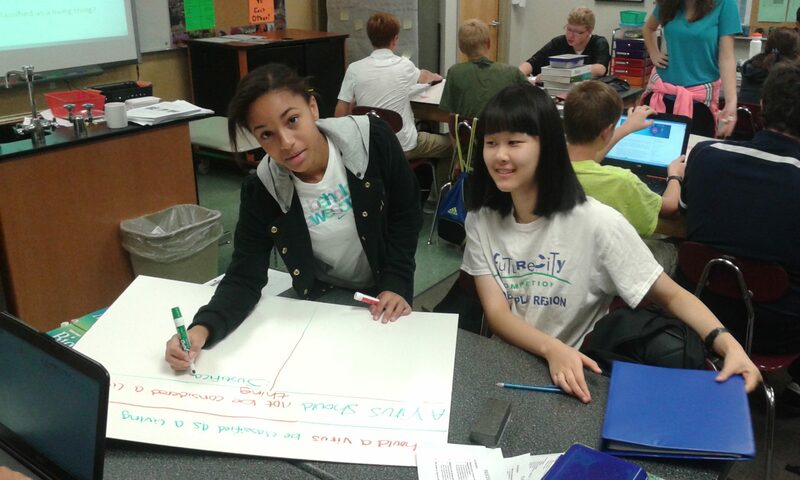 Students were going as far to research and describe plasmid structure, and how that may affect their claim. I did not ask for a specific amount of evidence, but only that it be sufficient to defend their answers to the guiding question. Once the evidence and justification was gathered, we all had a round-robin where we went around and critiqued other groups arguments and evidence. Many of my students sided with the camp that viruses are non-living, but I had a couple groups that defended their status as living things. This made are initial argumentation session somewhat one-sided, but the conversations we had were excellent. After students recieved critiques, they went back and reformed their arguments if needed, and turned in final written arguments as groups. 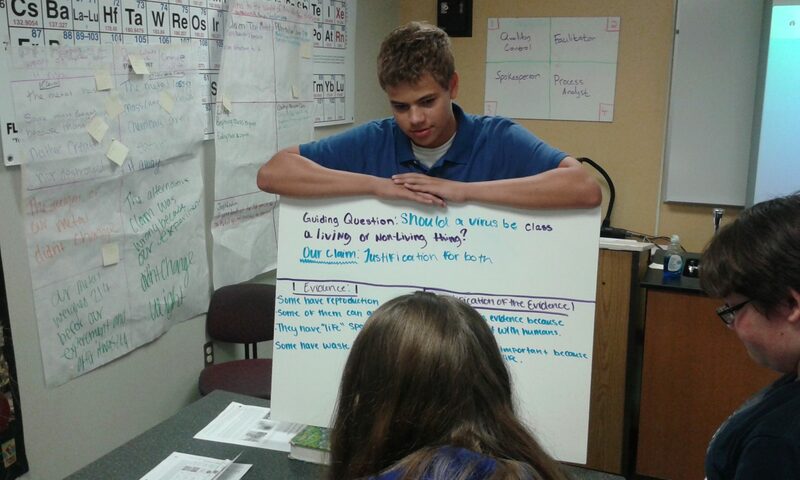 A student in my class defends his group’s divided claim on virus’ living status. Some groups found evidence to support both sides, and were a little divided on whether viruses fit the model for life. Having this experience made teaching the characteristics of life much easier. I am now having my students forming arguments on “Why do Great White Sharks travel such long distances” as a way to study animal behavior and ecology. We are using real shark tracking data from a group called OCEARCH , and going deeper into the process by having students formulate their own methodology for collecting data. My advanced bio classes will also be doing a peer-review of final argument papers to help improve their content writing. So far, my students seem to really enjoy the process of argumentation and I hope to post more on this topic in the future. For now, I am passing the torch on to our Kansas Teacher of the Year, Shannon Ralph, to see what’s going on in her classroom. Very cool! I love this idea of studying the characteristics of life.